There are certain products on the market that generate a certain type of “cult following”. The reasons behind these followings can be numerous; whether it be down to the groundbreaking nature of the product, its originality, or simply its WOW factor. Every so often, a fixture comes along that turns heads and breaks the mould. For years, the idea of an “affordable” DJ console was something that was sniggered at by many in the industry. Users generally tended to fall into two very different ends of a spectrum, with those who favoured their DIY, home-made solutions standing on one side, and those with their top-of-the-range flagship mixers at the other. 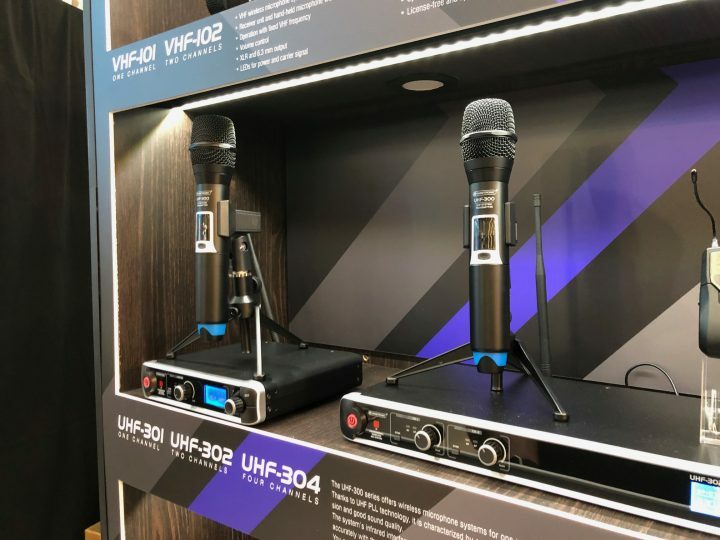 That was until Omnitronic, the first Audio brand presented by Steinigke nearly 20 years ago, released a product that followed the brand’s mantra of making products of quality and reliability accessible to all users and not just those who could afford the high-end. This concept of high quality products in an affordable section of the market helped the company to gain a large fan base, which in turn allowed for development of more products. 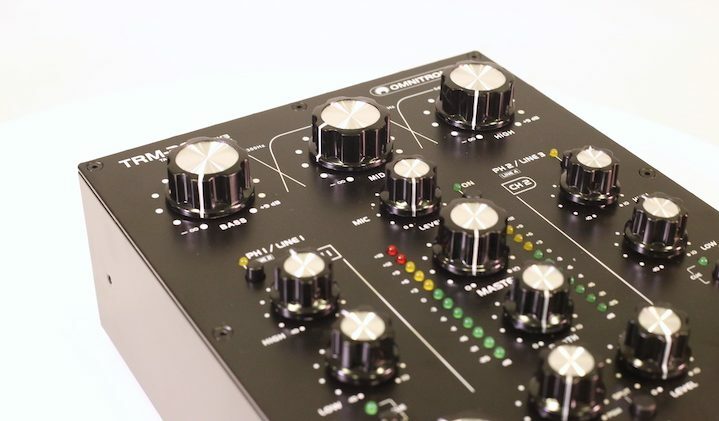 In 2017, Omnitronic released the third iteration of one of their most popular and famed products; the Omnitronic TRM-202. We first heard about the TRM-202 MK3 a few weeks before Prolight & Sound Frankfurt earlier this year. Naturally, it was one of our first points-of-call at the show, where a single demo model was available for preview. The team on the Steinigke booth were clearly very proud of what had been produced, and we grew excited about receiving a test product for review. The TRM-202 MK3 builds on the successes of the first two TRM-202 models, which received acclaim for their reliability and intuitive usability. A classic rotary mixer with 2 input channels and integrated 3-band frequency isolator, the immediately notable difference when compared to the previous generations is the new layout of the mixer, which takes a more rectangular shape which has a layout which has been streamlined. The two channels of the mixer are clearly separated to the left and right of the console, with master controls in the centre and master EQ control to the top. 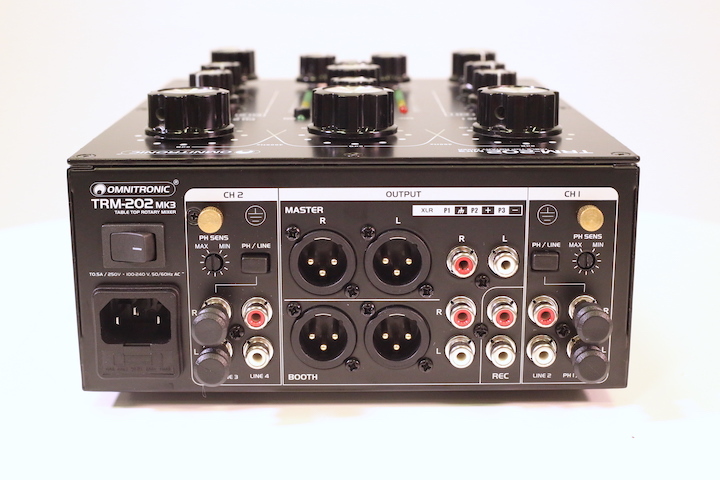 In terms of connectivity, the mixer only offers phono connections for input, providing four inputs – two phono/line inputs, and a further two phono inputs. 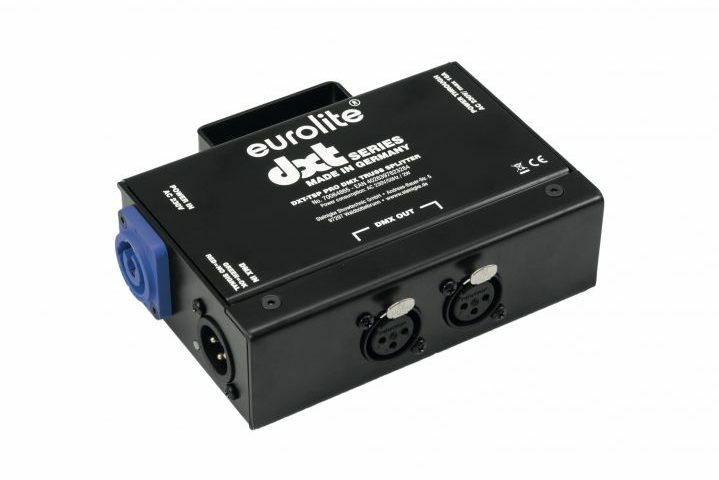 In terms of output, it does have extended flexibility with both phono and XLR outputs available. Something which has been added when compared to the previous version of this product is a gain control for each input channel. However, in order to keep the top of the mixer as clean as possible, these regulators have been added to the rear of the unit, next to the input connections themselves. The mixer features Vintage ALPS potentiometers (Blue Velvet RK27). There’s a lot of letters and numbers there, but in layman’s terms, this equates to rotary knobs that really do feel of the highest quality. Prefader listening can be set to input channels and the master output, via an adjustable headphones output, with cue mix/split function. Outputs available include Master, Booth and a Record output, a nice addition for those wanting to directly record their mix. 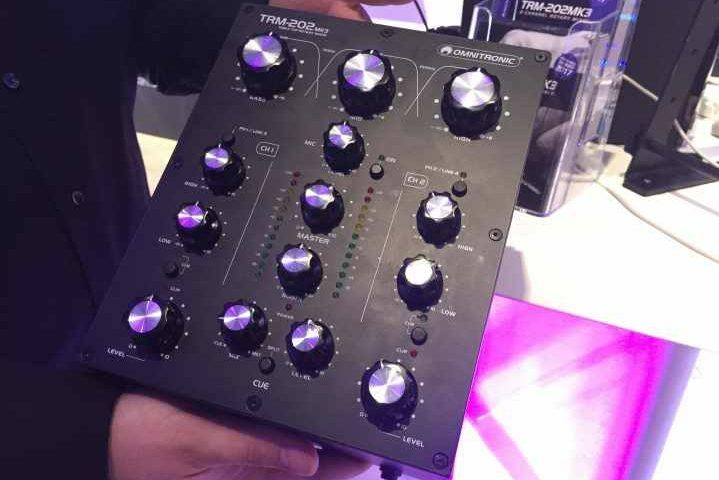 We handed the product over to two local DJs to do a hands on test, deliberately choosing one DJ who was used to using fader consoles rather than rotary, and the other vice versa. The choice of whether to use a rotary or fader controller is after all a very subjective choice, and we saw the importance of gaining feedback from those from either camp. First up, some general feedback from both of our testers, who both spoke highly of the overall build quality of the unit, as well as its aesthetic appeal. The mixer certainly does not look out of place with a pair of high-quality turntables, with the simplistic yet stylish design blending nicely into the setup. 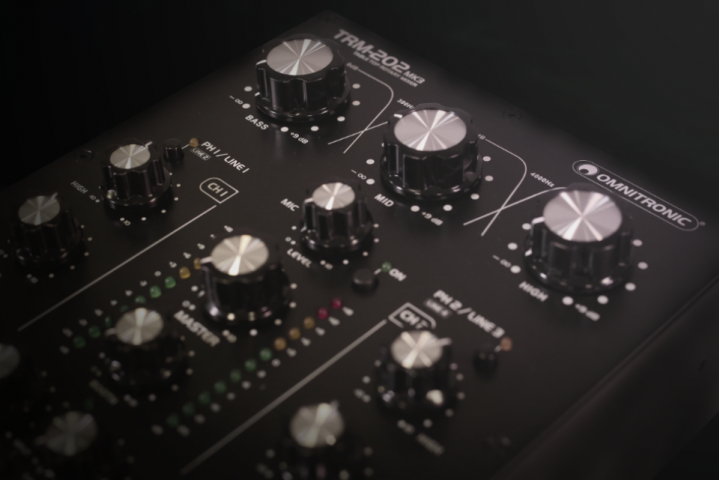 In terms of build quality, the unit is sturdy and rigid, and does not have the same “cheap” feel that many mixers at a similar price point can emit. In terms of usability, both of our DJs found the rotary controllers to have a nice balance between smoothness and resistance. Our fader-favourer (yes, we’re coining that term) did express some concern in making fast “flick” transitions, however this is a mixing technique that is naturally going to be more weighted towards a fader-based mixer. From our rotary-user, we received good feedback on the ability to make smooth and “musical” transitions, something that would potentially be more appreciated by more “traditional” beat-matching DJs. Regarding sonic-quality, we certainly couldn’t hear any deterioration to the sound when played with a flat EQ, and indeed the EQ parameters seem to be nicely calibrated to appropriate frequency points, giving a good level of control. Both users expressed a likening for the dedicated boost & kill cut, giving the ability to quickly and efficiently add or remove frequency changes into their mixes. Whilst this console certainly doesn’t aim to appeal to high-end users, it certainly has a solid place in the market in making a high-quality, robust and feature-inclusive product accessible to entry and mid-level users. The unit emits a note of “timeless class”, through both its stylish design and high-quality feel. We feel that this version is more suited to blending into a more modern workspace, one which is more streamlined and minimalistic, without losing any features or compromising on the user experience. 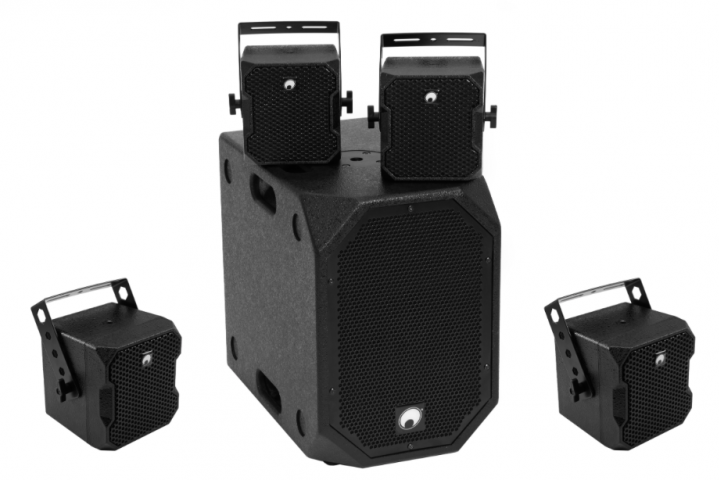 In terms of features, although the product isn’t an all-singing and all-dancing offering, it has all the features that other units within a similar and even slightly more expensive price bracket would contain, and delivers them in a fixture that is appealing and efficient. 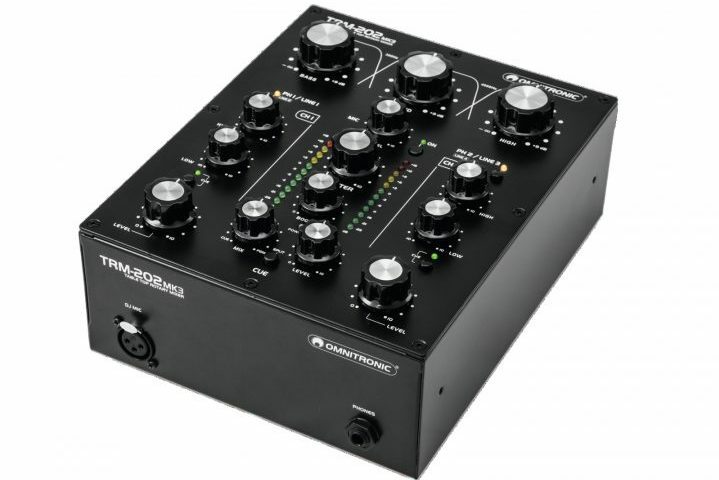 For those looking to either enter the world of DJing, or those looking to step back to a more simplistic or even “musical” way of working, then the Omnitronic TRM-202 MK3 is certainly a sensible and attractive choice.